The Ottawa Child and Youth Initiative is behind several campaigns, and currently executes and supports several projects and initiatives which are aimed at helping children and youth in Ottawa to grow up great! 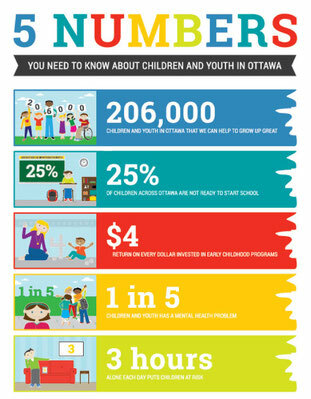 The Ottawa Child and Youth Initiative 5 Numbers You Need to Know is an awareness and advocacy campaign around 5 critical numbers relating to children and youth in Ottawa. It is supported by the recently launched Frontline Reflections Blog, where key players in child and youth health in our community have taken the time to help us glean a deeper understanding of the significance of each number for children in Ottawa.